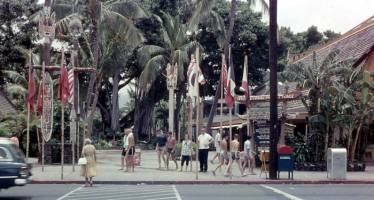 In 1957, the International Marketplace was opened in Waikiki, Hawaii. At the time, it was considered to be a first-rate attraction, which was primarily focused on catering to tourism, but also provided a unique atmosphere for locals. All around the marketplace were dangling vines, tikis, foot bridges crossing over dark pools and various other forest-like details which gave the marketplace a mysterious and enchanting feel. The original layout was meant to feel like little villages found in Japan, Korea and China. The design featured a labyrinth of criscrossing pathways, which many found easy to get lost in. Among a number of shops that sold clothing and different foods, the marketplace also housed nightclubs where generations of notable island musicians would come to play. 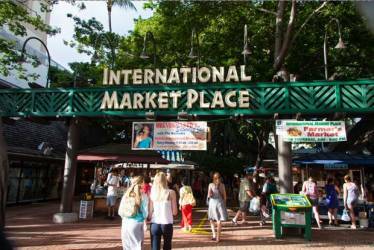 In March of 2014, it was announced that the International Marketplace would be “revitalized”. With increased tourism since its opening, it was time to update the marketplace into a more modern shopping center. The shopping center will be approximately 360,000 square feet and will feature open-air retail, dining and entertainment. The shopping center will include 75 retailers, seven restaurants, and a full line Saks Fifth Avenue. 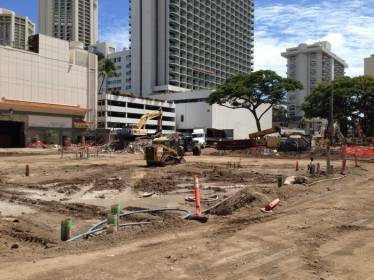 Although it appears to be the construction of just another shopping center, the idea is to offer an environment that honors Queen Emma’s legacy. As a means of doing this, the new International Marketplace will directly support the Queen’s Medical Center, which is the state’s largest non-profit hospital, by providing new and sustainable income. In June of 2014, Portland Bolt was contacted in regards to the anchor bolt requirement for this project. The majority of the anchor bolts required were high strength and possessed a forged head, or what is often referred to as a headed anchor bolt, and Portland Bolt’s manufacturing capabilities fit the need of the contractor perfectly. More specifically, the anchor rods required ranged from ¾” diameter to 1-3/4” diameter. As mentioned earlier, many of the anchor bolts required that one end have a forged hex head and needed to be manufactured to the F1554 Grade 36, F1554 Grade 55, and the F1554 Grade 105 specifications. There were also square anchor plates required. 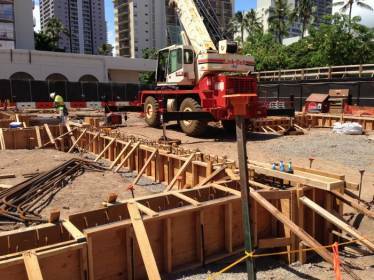 In total, the estimated weight of the anchor bolts shipped to the jobsite exceeded 9,000 lbs. In addition to the required configuration, there were also special packaging requirements for this particular project. Since they were traveling via ocean barge to Honolulu, Hawaii, it was required that all of the anchor bolts be packaged in custom wooden pallet crates and specially labeled so that there wouldn’t be any confusion when the shipment reached the jobsite.